Background: USP7 (ubiquitin specific protease 7, also known as HAUSP) is one of the deubiquitinating enzymes (DUB) that reverses ubiquitination and spares substrate proteins from degradation. Methods: After a brief introduction of ubiquitin-proteasome system (UPS) and human DUB, this review focuses on the structural and functional complexity of USP7 in tumor development and progression. Afterwards, physiological regulatory mechanisms and manipulation strategies for USP7 are elaborated. Finally, we discuss the advances and difficulties of USP7 as a novel therapeutic target for cancer. Results: It is mostly concerned that USP7 regulates the dynamics of the p53 and Mdm2 network by deubiquitinating both p53 and its E3 ubiquitin ligase, Mdm2. 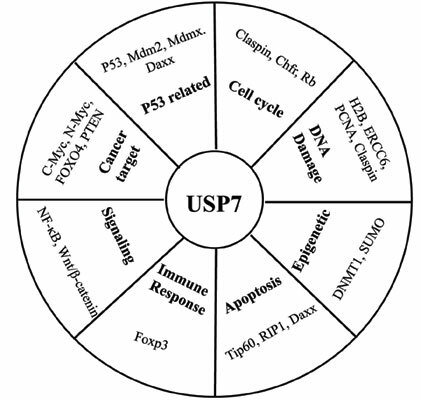 Recently, USP7 has also been recognized as a regulator of many other tumor associated proteins such as FOXO, PTEN and Claspin, consequently being involved in cell cycle control, DNA damage response, apoptosis and many other cellular processes. Consistently, aberrant USP7 expression and activity have been connected to various types of cancers, which along with lots of validating genetic and functional experiments make this enzyme a compelling target for the treatment of cancer. Currently disclosed inhibitor discovery programs and relevant research have identified several synthetic small molecules, natural compounds, small peptides and one ubiquitin variant that have specific USP7 inhibitory effects and considerable antitumor activities. Conclusion: Taken together, USP7 is a promising therapeutic target and USP7 inhibitors hold promise as a new approach to cancer therapy. Keywords: Apoptosis, cancer therapy, deubiquitinase, target validation, USP7, USP7 inhibitors. Keywords:Apoptosis, cancer therapy, deubiquitinase, target validation, USP7, USP7 inhibitors. Abstract:Background: USP7 (ubiquitin specific protease 7, also known as HAUSP) is one of the deubiquitinating enzymes (DUB) that reverses ubiquitination and spares substrate proteins from degradation.